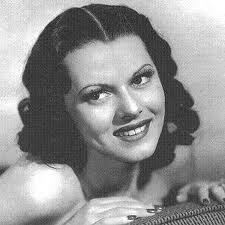 Actress Lorna Gray is best remembered today for her role as Mata Herring in the Three Stooges short film, You Nazty Spy! but her film career is much more than that. Born as Virginia Pound on July 26, 1917, in Grand Rapids, Michigan, U.S.A. she showed an interest in performing, singing with a group in Cleveland called Ben Yost’s Varsity Coeds, who sang in movie theaters before the film would begin. She had a film test for Universal Pictures, and actually had a short contract with Paramount Pictures, but it was after she was spotted in a fashion show by a talent scout for Columbia Pictures that she was signed for feature films — and in between, she appeared in several short films with the Three Stooges. Under the screen name of Lorna Gray, she appeared in several of the Three Stooges short films – as the spoiled wife Sherry in Three Sappy People, as the spy Mata Herring in You Nazty Spy!, and as one of the female co-stars in Oily to Bed, Oily to Rise and Rockin’ Thru the Rockies. These are some of the best Three Stooges short films, but in her time at Columbia she appeared with John Wayne, Boris Karloff and Buster Keaton as well. In 1945, Lorna Gray left Columbia Pictures and moved to Republic Pictures, where she changed her screen name to Adrian Booth, which is what she goes by today. At Republic, she continued her screen career, appearing in many films; in 1949, she married David Brian, and retired from the screen two years later. Lorna Gray was May Jenkins.